A strange and very rare meeting at the Ghostgate. Talk to Wulf at the Tower of Dusk in Ghostgate. Accept his Old Man's Lucky Coin. Talk to Lalatia Varian at the Imperial Chapels in Ebonheart, who will explain this event. 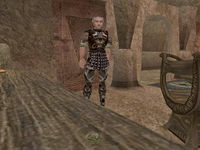 Though not really a quest per-se, once you obtain Wraithguard from Vivec in the course of the Main Quest, the Imperial warrior Wulf will appear in Ghostgate's Tower of Dusk. Speak to him and he will ask you to carry an Old Man's Lucky Coin to Red Mountain as a favor. If you ask anyone in Ghostgate about Wulf, they will not know him or that he is there. After you leave the temple, he will disappear for good. The coin isn't anything special in itself, but when you accept it you gain a new power, the Luck of the Emperor (Fortify Luck 20 pts for 120 secs). It turns out that Wulf was actually the manifestation of the god Tiber Septim. If you talk to Lalatia Varian at the Imperial Chapels in Ebonheart, she will explain this event and you'll gain two Reputation points. You'll also be able to hear about it through the rumor mill, as any Imperial Guard will be impressed that you saw Tiber Septim in the flesh. Wulf doesn't yield any special items if you kill him, but interestingly he carries a decent amount of moon sugar. 10 Finishes quest I told the Oracle about my encounter with the old Imperial veteran, the lucky coin he gave me, and the mark of good fortune -- the luck of the Emperor -- I have felt ever since. The Oracle thinks I have been visited by an aspect of Tiber Septim. She takes this as a sign of a great doom laid upon me by the gods.